Landscape Visions: 1 What’s in your landscape? Joseph Mallord William Turner, The Passage of Mount St Gothard. Taken from the Centre of the Teufels Broch (Devil's Bridge), Switzerland (1804), watercolour and scraping out on paper, 98.9 x 68.6 cm, Abbot Hall Art Gallery, Kendal, Cumbria, England. WikiArt. Although not one of the more valued genres, landscape painting became enormously popular in the nineteenth century, both among artists and their public. The Impressionists were, first and foremost, landscape painters; even Renoir, purveyor of protruberant nudes to the trendier gentry, felt it necessary to paint dozens of canvases devoid of the delights of female flesh. Despite Degas’ inability to paint in sunlight and his predilection for ballerinas and bathing women, he too created landscape paintings. Unlike other genres, in which a motif might be detached from reality or even completely imaginary, landscape painting has always seemed to be simple and direct: pick your view, and paint it. But cast your eye more carefully over those works and there is clearly much more to it, or at least to some of the best landscape paintings. This new series attempts to tackle landscape painting in a novel fashion. Rather than trace its history and development, or consider how it was influenced by different movements, I am going to try getting inside the artistic imagination of important landscape painters, and discovering the vision that each had of the landscape. This is not dissimilar to the synthetic approach adopted by Malcolm Andrews in his book Landscape and Western Art, although his themes are not derived from the artist’s vision. for Linnell, faithful transcription of the material world revealed the divine purpose, thus his higher vision. The lives of all three overlapped considerably, placing them in the same chapter of a simple chronological account. William Blake is normally considered a Romantic (or Pre-Romantic), Samuel Palmer a full-blown Romantic, and John Linnell a Naturalist or realist. History and convenient labels therefore make them appear far closer than their paintings – the material realisation of their visions – actually are. Because this enterprise is novel, and to a great degree exploratory, I cannot trot out a prepared list of visionary themes. Those will develop as the series does. To give you an idea of the types of vision that I have in mind, here are some hors d’oeuvres. Some of the earliest landscape paintings are very loose in scale and layout, focussing more on depicting prominent, important, or interesting features arrayed in a general space. In this fresco from Thera, Greece, beasts and other symbolic objects of importance are arrayed along the Akrotiri River, as if symbols on a map. You can almost hear the artist telling you “here are wild animals”. Anonymous, Akrotiri River (before c 1627 BC), fresco, Thera (Santorini, Greece). Wikimedia Commons. With their roots in the construction of military views and maps, and sometimes a key part of espionage, many landscapes were intended to provide detailed information about the location and appearance of features – the opposite of a loose catalogue of contents. 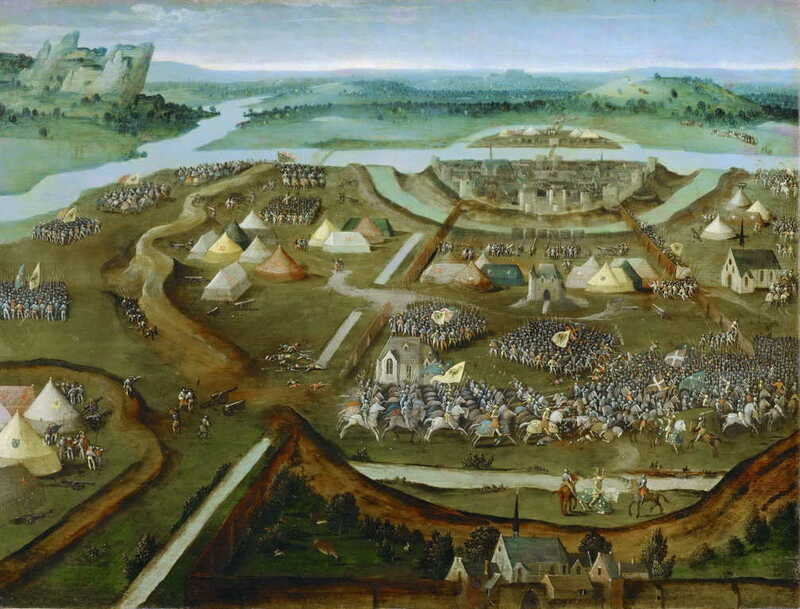 A slightly puzzling example is this depiction of the Battle of Pavia which took place in 1525, the year after Patinir (who is normally credited with the painting) is recorded as having died. (Attr. Joachim Patinir), The Battle of Pavia (c 1530), oil, 32 x 41 cm, Kunsthistorisches Museum, Vienna. Wikimedia Commons. 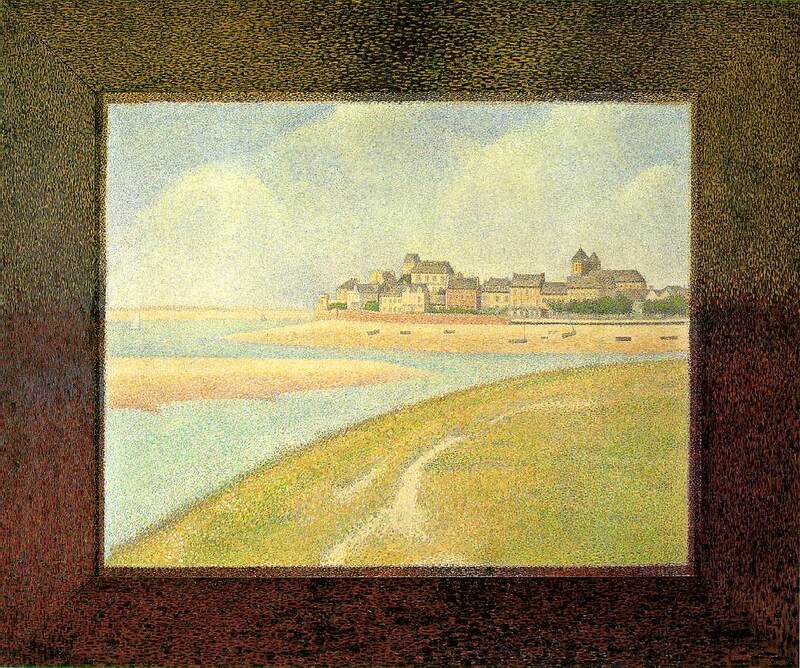 As Michelle Foa argues in her recent study on his work, Georges Seurat painted multiple views of ports on the French Channel coast and exhibited them in a fixed layout intended to help the viewer construct a 3D model of the port in their mind. Although Seurat was unusually meticulous, other artists have used single or multiple views of the same location to help the viewer assemble a 3D visualisation. Georges Seurat, Le Crotoy (Upstream) (1889), oil on canvas, 70.5 x 86.7 cm, Detroit Institute of Arts, Detroit. WikiArt. Landscape appeared in special vignettes within paintings made by the van Eycks and others in the early Northern Renaissance. Others, even well into the twentieth century, have shared similar visions in which the ‘great outdoors’ is cropped and kept captive in the repoussoir of a garden, window, or canvas. While repoussoir effects can enhance depth in a painting, these may form ‘paintings within a painting’, and the like. This particular example shows a delightful and very detailed landscape vignette, tucked away in a portrait now believed to be of Saint Ivo, by Rogier van der Weyden of the Northern Renaissance. 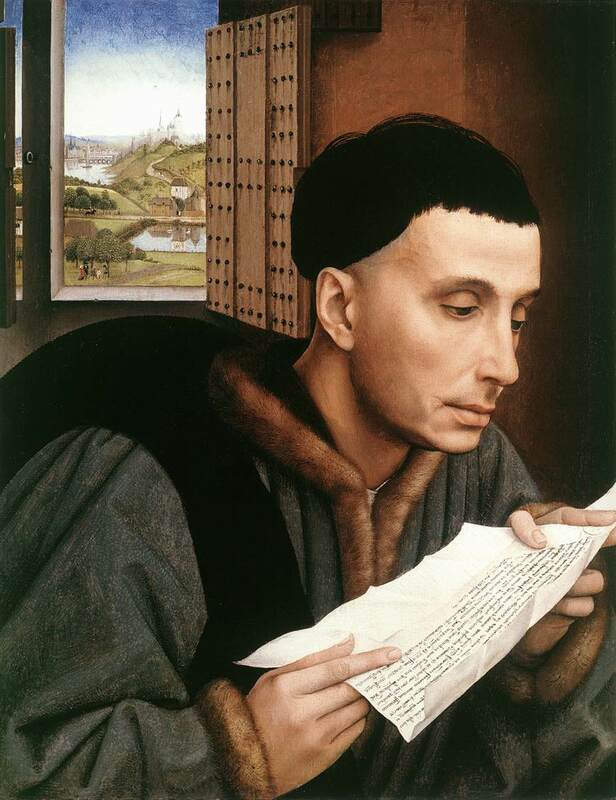 Rogier van der Weyden, Saint Ivo (Portrait of a Man Reading) (1450), oil on panel, 45 x 35 cm, The National Gallery, London. WikiArt. For many artists, a landscape is merely the backdrop to a portrait, narrative, or figurative painting. My example here, by Bassano, could almost have been painted that way in a studio, with a large painted canvas held behind models posed in wooden boats. Better integrated works may set some of the figures further back, behind landscape props such as trees, but the artist’s intention may remain much the same. 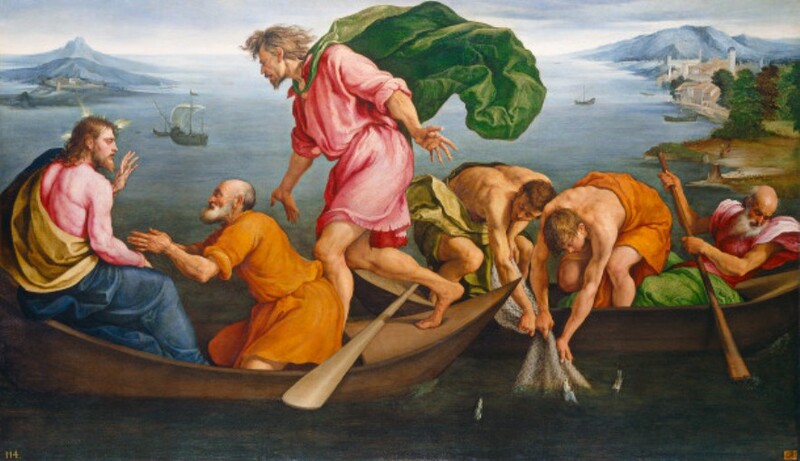 Jacopo Bassano, The Miraculous Draught of Fishes (1545), oil on canvas, 143.5 x 243.7 cm, National Gallery of Art, Washington DC. WikiArt. Many countries which celebrate Christmas mark the build-up to the festival with small calendars, in which each day is accompanied by locating and opening a small recess, which contains a sweet or gift: an Advent Calendar. There are landscapes which work in a similar way, with elements of a bigger narrative or meaning, or mere meaningless decorations, which are scattered around the picture. Some, such as this Poussin, beg the question as to whether there is some hidden meaning to them, which if we were to understand their context and how they each fitted together, might prove a form of steganography, perhaps. I have yet to see a credible account of such a hidden story in this wonderful landscape painting. 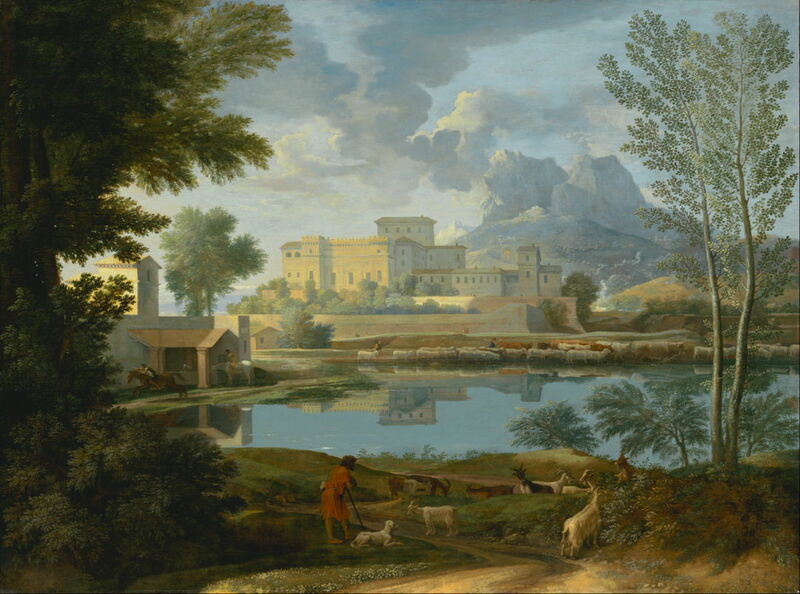 Nicolas Poussin, Landscape with a Calm (c 1651), oil on canvas, 97 x 131 cm, J. Paul Getty Museum, Los Angeles. Digital image courtesy of the Getty’s Open Content Program. Many landscape paintings are intended to inspire awe in the viewer, in the sense of Burke’s sublime. In some, exaggeration of the vertical scale, rugged and precipitous rocky cliffs, and bottomless chasms are used to heighten the spectacle. 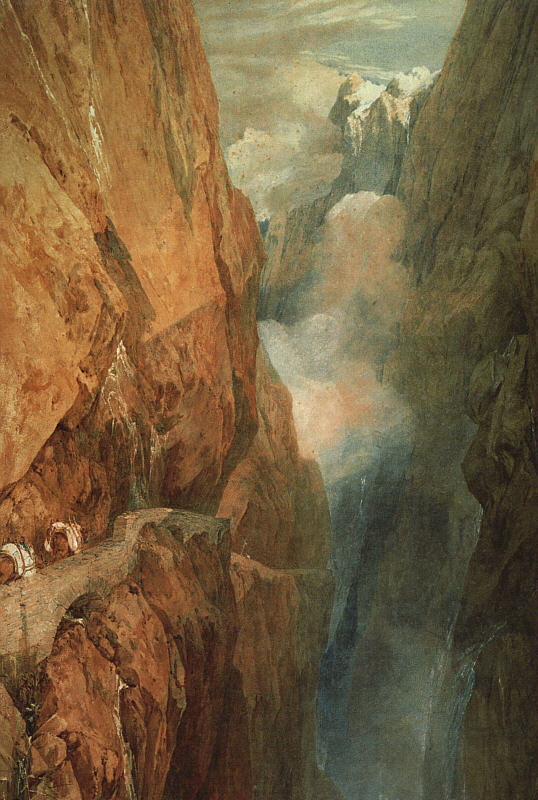 Although in Turner’s day the Saint Gothard Pass may have appeared as hazardous as he depicted in this painting, I suspect that he also exercised a little of his imagination to make it more spectacular than it actually was. Joseph Mallord William Turner, The Passage of Mount St Gothard. Taken from the Centre of the Teufels Broch (Devil’s Bridge), Switzerland (1804), watercolour and scraping out on paper, 98.9 x 68.6 cm, Abbot Hall Art Gallery, Kendal, Cumbria, England. WikiArt. A variant of simple spectacle is the sweeping panorama, which became popular well before the word was coined in 1789. Lusieri painted many stunningly detailed panoramas like this, each in watercolour and gouache, although this particular example dates from 1791, just after the word panorama entered the English language. Giovanni Battista Lusieri, A View of the Bay of Naples, Looking Southwest from the Pizzofalcone Toward Capo di Posilippo (1791), Watercolor, gouache, graphite, and pen and ink on six sheets of paper, 101.8 x 271.9 cm, The J. Paul Getty Museum, CA. Wikimedia Commons. I have already referred to the relationship between the reality of a physical landscape and the different visions of Romantic artists, and here offer two contrasting examples, the first from Samuel Palmer, the second from the more dedicated vision of William Blake. Although Palmer’s painting is clearly looking beyond the material world, it remains rooted in that world, creating a feeling of eeriness and otherworldliness. 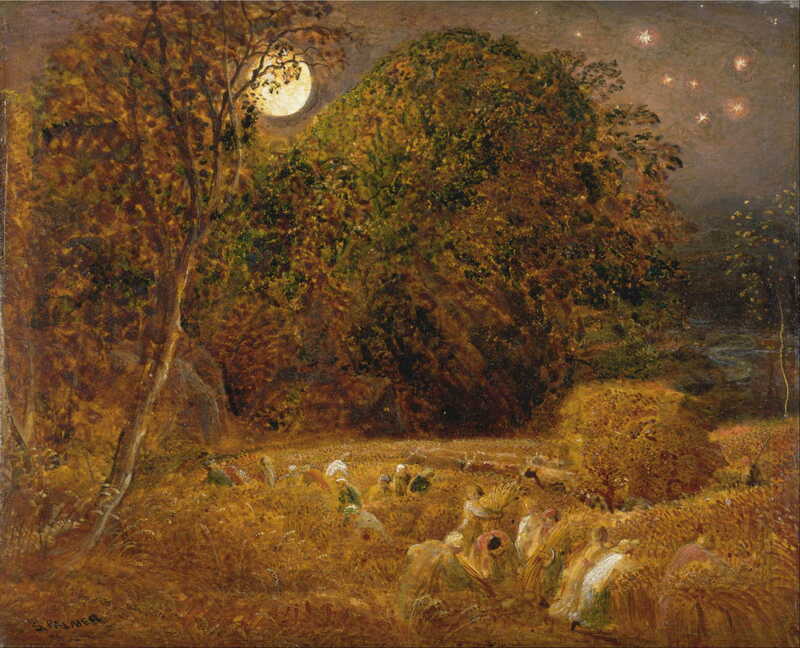 Samuel Palmer, The Harvest Moon (c 1833), oil and tempera on paper, laid on panel, 22.1 x 27.7 cm, Yale Center for British Art, New Haven, CT. Wikimedia Commons. For Blake the landscape is almost an irrelevant backdrop to his much more distant and different vision. 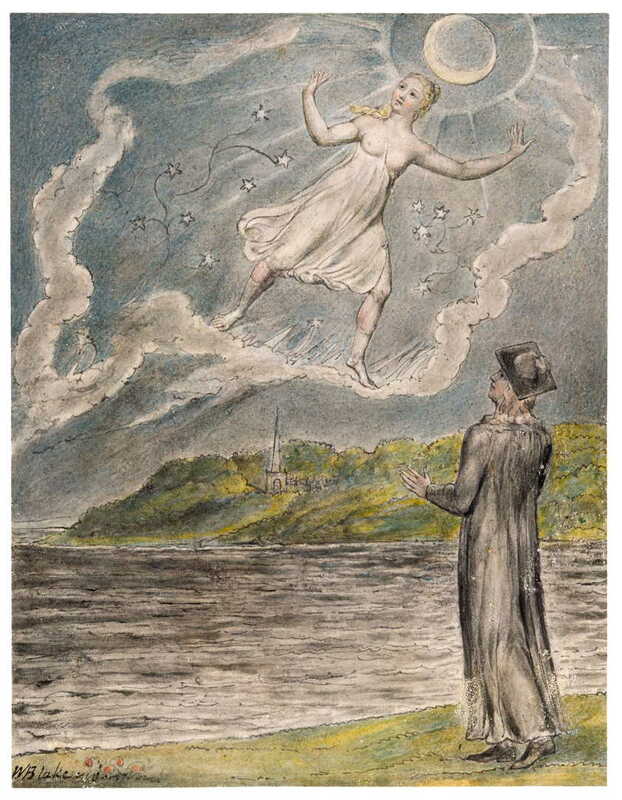 William Blake, The Wandering Moon (illustration to John Milton, L’Allegro and Il Penseroso) (1816-20), watercolour, 16 x 12 cm, various locations. WikiArt. Sometimes artists choose motifs which have inherent regularities or patterns, may exaggerate such forms, or may create them afresh. 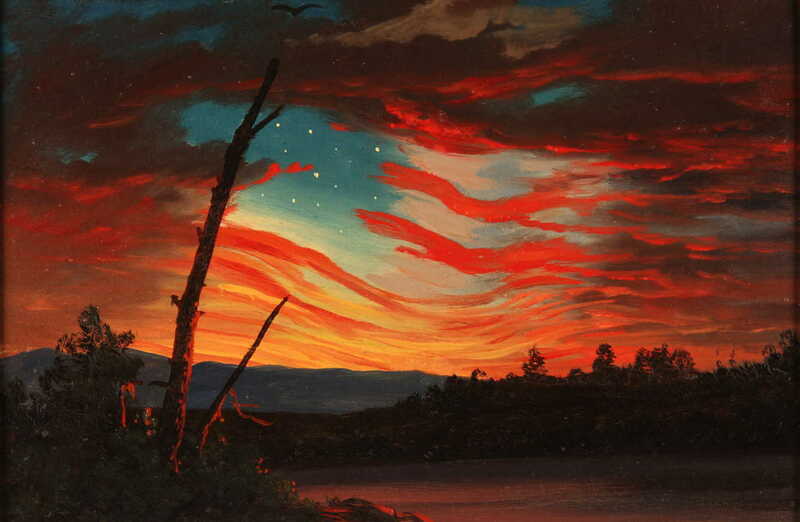 This vivid example by American realist Frederic E Church shows his vision of the Stars and Stripes in ribbons of cloud lit by the dawn sun. Frederic Edwin Church, Our Banner in the Sky (1861), oil on paper, 19.1 x 28.6 cm, Smithsonian Institute, Washington DC. Wikimedia Commons. Hopefully these have given you an idea as to where I am coming from, and where we might be going. In a few days I will post the next article in this new series, and you can see whether I meet your expectations. Andrews M (1999) Landscape and Western Art, Oxford History of Art, Oxford UP. ISBN 978 0 19 284233 6. Posted in Painting and tagged Bassano, Blake, Burke, Church, landscape, Lusieri, painting, Palmer, Patinir, Poussin, Seurat, sublime, Turner, van der Weyden, vision. Bookmark the permalink.